The first two rounds of the competition were drawn in the same ceremony with all 57 entrants involved. 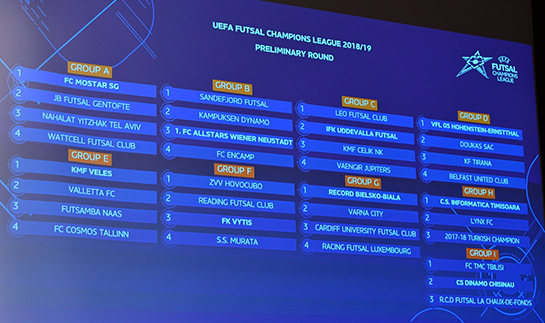 A total of 57 clubs have entered the new UEFA Futsal Champions League all will be involved in the preliminary and main rounds, which were drawn in 5 July. Four nations (Spain, Portugal, Russia and Kazakhstan) enter two clubs for the successor to the UEFA Futsal Cup and those countries' eight representatives – including holders Inter FS – are among the 23 clubs with the highest coefficients receiving byes to the main round. The other 34 sides start in the preliminary round, with the draws for both rounds made in the same ceremony. The entry from 53 associations is more than in any of the 17 editions of the UEFA Futsal Cup, with Iceland entering a club after a two-season absence.